Gymnastics.. The Basic Training For All Sports! 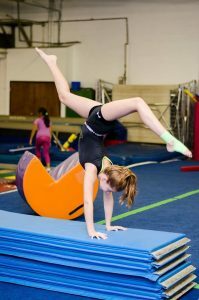 The many benefits of gymnastics training are to develop coordination, flexibility, strength and power, gain self-esteem and coordination, learn to listen and follow directions, social interaction, develop skills to enhance other sports, learn to set goals, learn fundamental movements and it’s FUN! 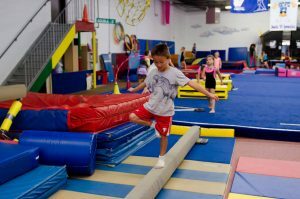 Classes are designed to utilize our gymnastics related equipment such as wedges, barrels, springboards, and trampolines along with specific skill progressions helping to develop strength, flexibility, and balance. The focus is overall fitness, coordination, and agility improving for all sports. Garnet Valley instructors are specialists in designing challenges disguised as FUN and encouraging kids to go beyond their perceived limitations. Recreational gymnastics is designed to provide a non-competitive, achievement-oriented program of progressive skills. In order to ensure each student is sufficiently accomplishing skills, we use "placement cards." These cards track a student's progress throughout our program. As students complete new skills, placement cards will be filled out by their coaches. Once all the skills on the card are completed successfully, the coach will give the card to the parent and suggest a more challenging class to enroll in. We use grade as the primary variable for determining your child’s class time. Considering each child’s experience and skill level we divide classes into logical, homogeneous groups. After trying different methods of “placement”, we have found this approach offers an excellent training situation for kids. It also allows us to be more flexible regarding personal scheduling problems.